Perspective views, such as block diagrams and fence diagrams have always been an important means of scientific visualiza- tion in geology. Advanced three-dimensional computer gra- phics is a new tool for the construction of such views. 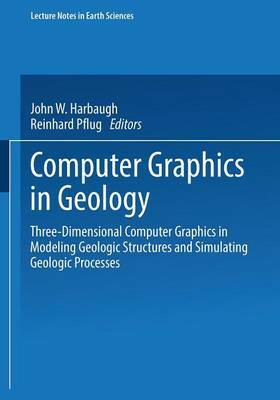 The book contains papers presented at the first large interna- tional meeting (Freiburg, October 8-11, 1990) that brought together working groups engaged in development of 3-D visua- lization programs for geologic purposes, and included people fromuniversities, government agencies, the mining industry (especially oil companies) and from software companies enga- ged in geology and geographic information systems. Many dif- ferent aspects of using three-dimensional computer graphics are discussed in the papers. Emphasized are different ap- proaches of modeling and rendering a 3-D geometric model, of transforming process simulation results into perspective views, and use of three-dimensional computer-graphics as an additional tool for interpretation and prediction. Prospec- tive readers include geologists and geophysicists from aca- demia, government and industry who should find ideason how to present and interpret their own geological observations and results with the help of three-dimensional computer gra- phics.